Today, Norm Goldman, Editor of sketchandtravel.com and bookpleasures.com is pleased to have as our guest, Dale Leatherman, Editorial Director and Glenn Harris, the Founder and Publisher of Caribbean Escapes. Good day to you both and thank you for participating in our interview. Dale, can you tell our readers something about yourself and what does travel mean to you? Dale: Norm, I've had the writing bug since third grade, and the travel bug since junior high. But my love of horses came first. After college I became a professional trainer, exhibitor and coach on New York's hunter-jumper circuit. I retired from competition to become an editor at an upscale equestrian lifestyle magazine, and after several years realized that doing travel articles was what I enjoyed most. My first trip to the Caribbean in the early 1980s was for POLO magazine, and I knew that this would forever be one of my favorite places. Eventually I became a freelancer specializing in golf, adventure and the Caribbean. Why did you feel compelled to put together Caribbean Escapes and how did you get the inspiration for this book? Dale: The inspiration was Glenn Harris's and I will let him answer that. When he approached me with the idea of a multi-faceted marketing program focusing on the Caribbean for affluent travelers, I was immediately hooked. Glenn had the vision and experience on the marketing end and I was honored to lend my writing/editing skills to the project. Together with a team of talented writers, photographers and designers, I think we've produced something rather grand. The most visible aspect of the program is Caribbean Escapes, an oversized, 400-page coffee table book that is a page-turner of good writing as well as a handy tool for choosing a vacation destination, resort and activities.including dining and shopping. Glenn: I've worked in the Caribbean for 15 years, most recently as the head of marketing and public relations for American Express. I love the region: the people, culture, and of course the sun and sand. Each island has something unique and special but I felt that many travelers were not informed. There are over 35 countries in the Caribbean, our goal is to educate potential travelers on the uniqueness of the islands and the upscale resorts options. We do this through the book and a TV show that we.ve produced which covers 25 of the destinations and 100 resorts. How did you go about choosing the contributing writers and photographers? Dale: I started with my trusted fellow members of the Society of Travel Writers who specialize in the Caribbean, then added more writers that they recommended until we had a cadre of experts who are passionate about the region. Glenn chose SATW Photographer of the Year Greg Johnston and his savvy wife France to coordinate the images, most of which are Greg's. An inspired choice, as it turned out, for the book's artwork is a show in itself. *** I particularly like Raffles Canouan in the Grenadines. The spa has over-water palapas that you get to by rowboat. During your massage you're looking down through a window in the floor at the fish swimming below. After your spa treatments, you and your mate lounge there in your own private palapa. The villas are secluded by dense foliage, so there's plenty of privacy. There's also a secluded beach on the other side of the island that's usually deserted. *** Cayo Espanto, a small private island resort off Belize offers the ultimate in privacy and service. A handful of luxury beachfront casitas with alfresco showers and plunge pools are scattered around the island. You could stay here for a week and never see another soul except the maid and the fellow who brings your drinks and serves your meals anywhere you want them. *** Even though Casa de Campo in the Dominican Republic is a big, bustling resort, it's also romantic. Strolling through the cobblestone streets of Altos de Chavon by lamplight and dining in outdoor cafes is wonderful. It's a cliff-top Medieval village recreated by hand of stone, wood and iron in the 1970s to house an artists' colony, shops and restaurants. *** I also love the beach at Half Moon Resort in Jamaica, particularly watching the sunset from the gazebo out on the water. The villas along the beach are secluded by hedges and many have private pools that are perfect for a moonlight skinny dip. *** Four Seasons Nevis has a great beach to stroll at sunset, and you can arrange to have a private dinner for two served at a table right on the beach. The spa is also exceptional. After your treatments you can swim in the secluded garden waterfall pool, or relax in a lounge chair listening to the waterfall. *** Laluna LaLuna is a small 17 cottage resort on a secluded white sand bay in Grenada. It's owned and designed by fashion designer Bernardo Bertucci. Canopy beds, outdoor showers, excellent meals and a great private beach. Couples only. If someone doesn't find this place romantic, I'd advise that they check their pulse! *** Island Outpost Island Outpost has small intimate properties in Jamaica and one in the Bahamas. Golden Eye, Strawberry Hill, The Caves, Jakes, and Pink Sands. IO is owned by Chris Blackwell of Island Records and who discovered Bob Marley. Each of the resorts is very romantic and developed for lovers. They are all very special properties. *** Kamalamae Cay Kamalamae Cay is a small property on a private island in Andros in the Out Islands of the Bahamas. This is the ultimate in seclusion. You'll only see the other guests there&if you wish. There is plenty of space on the island to explore. The cottages themselves are made for romance with wonderful bathrooms, amenities, and beds. The staff in very attentive and catering to the couples needs. *** Ladera, St. Lucia Ladera has won just about every award for excellence in the Caribbean. It's also blessed with arguably the best view across from the Piton Mountains in St. Lucia. The villas are high up in elevation so there is never a bug problem which allows for the villas to have an open wall with awesome views of the Pitons. Many of the villas have plunge pools as well. The meals are to die for as their restaurant Dansheen also wins numerous awards. *** Le Toiny Le Toiny is a ultra posh resort in St. Barth. It is comprised of private villas each with its own pool, large bathroom, living room, and separate bedroom. Every conceivable amenity is included from high end stereo to flat screen TV. Breakfast is served on the lanai next to pool in the villa. The restaurant is also one of the best on the island. What challenges or obstacles did you encounter while editing Caribbean Escapes? How did you overcome these challenges? Dale: The sheer size of it was a bit daunting.more than 120 articles, many by writers with vastly different voices. My job was to perform delicate nips and tucks in places no one would notice, like a plastic surgeon enhancing the beauty of a subject. It was time-consuming work that took the better part of a year, with the staggered deadlines. But the writing was so good I sometimes found myself reading copy aloud, admiring the creativity. How safe is it to travel in the Caribbean? Dale: I have always felt safe in the Caribbean, often safer than in cities at home. There's no terrorism and the islanders for the most part are genuinely welcoming. But, as in anyplace you travel, including the U.S., you have to be sensible and keep track of your possessions. Glenn can comment further on this. Glenn: Most of the islands are relatively safe as the governments and the locals know that their economies depend on tourism. But be mindful that you are not a local. Travelers should use the same common sense that they would use in traveling in a city such as New York, Miami, or LA. If the traveler is unsure if an area is safe, they should talk to their front desk or concierge. When is the best time of the year to visit the Caribbean? Dale: Unlike the "old days" when winter was considered "the season" for the Caribbean, there is no longer an off season. Many travelers go in the summer, when their children are off from school or it is easier for them to take vacations from their businesses. The islands in summer are often cooler than at home, because of the constant sea breezes.and the days are blissfully long. That said, I think it is absolute bliss to leave home when there is snow piled head high and, after a short plane ride, step out into a warm Caribbean breeze carrying the scent of the sea and flowering plants. The fall hurricane season is on everyone's minds after the devastation on our own southern coasts, but what travelers need to realize is that the islands of the Caribbean are very storm savvy. Resorts and services bounce back within days. And top resorts are liberal about rescheduling or refunds if your vacation is cancelled because of a storm. GLENN: Dale's covered it. In agreement with Dale, the Caribbean is not just for the wintering anymore. They are a great destination in any season. The spring, summer, and fall also provide much lower rates and more value. Any unique ways you'll be marketing your book that is different from how others authors market their books? 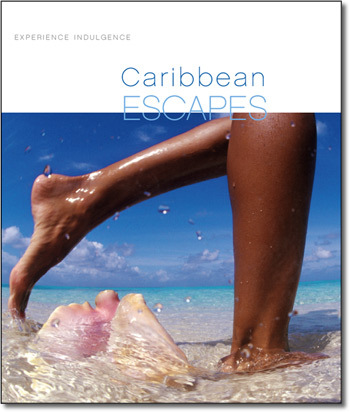 GLENN -- Caribbean Escapes is more than a publication. It's a comprehensive way of providing information about what the Caribbean has to offer for the affluent traveler. In addition to book fairs and direct sales to bookstores, we also have a TV show and website focusing on upscale Caribbean travel. In the TV show and website we promote the publication. The website is www.caribbeanescapes.com and the TV show airs through out the US. Books can also be purchased on line. What's your advice to achieve success as a travel writer? Dale: It's a very tough field to break into these days even harder if you intend to actually make a decent living rather than depend on the support of a spouse. I'm glad I have a long track record 25+ years--because it lands the assignments I need to make a living and enables me to visit new, exciting places. Wannabes who think it's all about free travel must understand that it's really all about getting assignments to write about the places you want to go. The assignments come first, when you've finally gotten an editor's attention with a good query. That's not easy in this very competitive environment; there's a lot of self-marketing involved. In other words, don't quit your day job. My advice is to prospective travel writers is to specialize in something at work or play so that it can be a unique twist to travel editors business travel, travel with children or pets, sports travel, etc. As I mentioned before, my equestrian background opened the door to travel and travel writing. Eventually I took the plunge into full-time freelancing, which is really tightrope walking without a net, but I've been at it a lot of years and wouldn't trade it for anything. This is a lengthy answer, but you can tell I love the business and I admire the writers who are good at it, like those who contributed to Caribbean Escapes. Glenn: I would say that the Caribbean is a beautiful and exotic destination. It has a range of travel options from rustic to opulent. The same goes for the hotels. The informed travelers will determine for themselves what they are looking for; is it peace and quiet, adventure travel, night life. What ever it is, the Caribbean has it and Caribbean Escapes has been developed to provide the information for the affluent traveler to pick the perfect destination and resort. Thanks once again and good luck with Caribbean Escapes.